This page will provide you with information about having a peripheral nerve block in an upper limb. For further details, please speak to your consultant. A peripheral nerve block of the upper limb is a form of regional anaesthetic, whereby a local anaesthetic or another form of painkiller is injected near to the nerves that connect with your arm. The procedure works by provisionally numbing the nerves, thus resulting in pain relief. An arm-based nerve block can be used instead of general anaesthetic for an operation and can be used either on its own whilst you are awake but sedated, or alongside a general anaesthetic. It can be used as a replacement for general anaesthetic during an operation and also as a form of pain relief after an operation. There are various sites for injection of a peripheral nerve block. These differ depending on the operation in question, but include: the side of the neck, near the collarbone, near the armpit, in the elbow, forearm or wrist (see Figure 1). 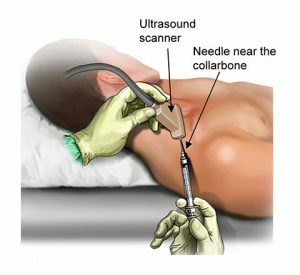 An ultrasound scanner and nerve stimulator will be used by the anaesthetist to locate the best position for injection of the painkillers. A needle will be inserted into the spot chosen before the anaesthetic is injected. After this, a small tube may be inserted through the needle and left in place so that additional anaesthetic can be injected, should it be needed throughout the procedure. A peripheral nerve block of the upper limb is a relatively safe and effective form of pain relief, and is therefore recommended for use on most patients, either during or post-operation.